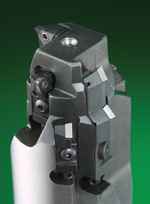 Tool Fab is uniquely gifted as a manufacturer of special tooling. We combine close tolerance 5-axis CNC machining, CNC grinding, and in-house EDM and tool balancing capabilities with decades of tool design experience. Why deal with different tool manufacturers on different types of special tooling? With Tool Fab you can consolidate your suppliers and gain access to all of the major types of custom cutting tools and brazed tools under one roof! We manufacture everything you see in this catalog at our state-of-the-art facility in Milwaukee, Wisconsin. Tool Fab is known as a premier manufacturer of the widest variety of custom-engineered or “special” cutting tools in the United States. We work closely with our manufacturing customers, and we often share approval prints digitally to maximize tool production speed, accuracy and consistency. Engineering software compatibility is an efficient and productive communication link between your engineering department and ours! We will help our customers cut manufacturing costs, increase part production, improve quality, and increase profits. It is our mission to bring “Profitable Efficiency” to our metalworking customers. “Profitable Efficiency” means different things to different companies. To Tool Fab, it means we will help metalworking companies successfully tackle the challenges involved in combining tight manufacturing schedules with high-production output and close-tolerance part requirements to maximize our customers’ profit.We do this by supplying our customers with the widest variety of special cutting tools in the industry, with quick lead-times (usually 2-6 weeks) at competitive prices. Quality is an over-used word in business today. Tool Fab invites you to closely inspect our cutting tools. You will see the quality of Tool Fab’s tools immediately upon removing our tools from their packages. But wait until our tools are in the machine – this is where Tool Fab’s tools really shine! Tool Fab has earned a reputation for engineering and technical support that goes way beyond ordering from a catalog. Calling Tool Fab means that you will talk with a true cutting tool professional, and your manufacturing questions/challenges will be met with sound technical advice. And if that isn’t enough, Tool Fab stands behind the performance applications of our tools. You determine what you want the tool to accomplish and Tool Fab will design/manufacture a tool that meets agreed-upon specs to do the job! Quick Lead Times + High Production Output + Close-Tolerance Parts + Tight Manufacturing Schedules = Profitable Efficiency! Tool Fab’s quick lead times on custom-engineered (special) tools gets you machining the parts you need, when you need them… yesterday!